It's 1996, which means that for the last 27 years or so my family's regarded my obsession with cycling as being somewhat odd (strike out "somewhat"). I remember in fifth grade riding my bike (a Schwinn Varsity) out to the coast with a friend of mine...normal people just didn't do things like that. Especially when your dad's the editor of the sports section of the newspaper! But tonight (September 24) I come home from the shop and find a framed photo on the dining room table...one of those faded ones from the family album, only this is one I'd never seen before. 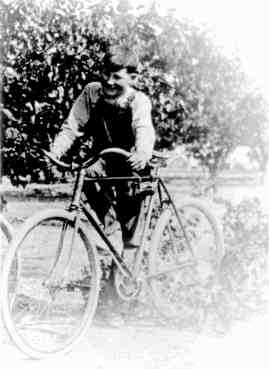 It's my grandfather, who's been gone for some time, with a bicycle in perhaps 1912 or so. Curiously, it was Grandpa (I called him Pompa) who was probably the most "worried" about my obsession with cycling; he grew up as a farmer in the Sacramento Valley, and it was his job to teach me about the real things in life, like hard work, strong coffee and pickups. Wish I'd come across this photo when he was still around!